Can We Talk about Mariah Carey's New Year's Eve Performance? 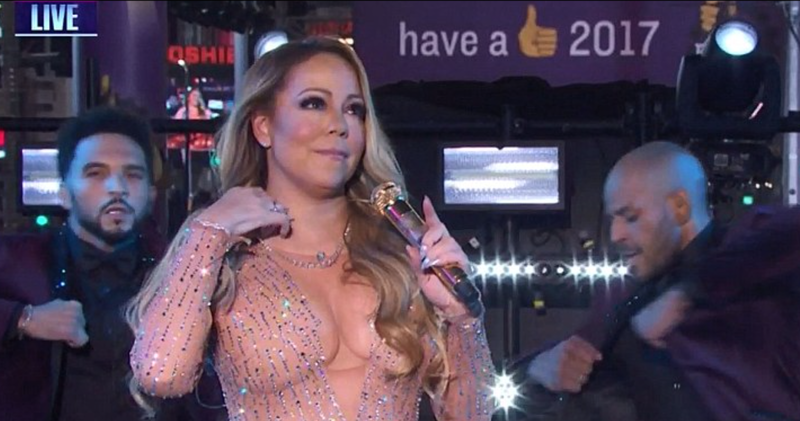 Okay Y'all.... We HAVE to talk about what went down during Mariah Carey's New Years Rockin' Eve performance on LIVE TELEVISION!!! But first, let me set up the scene for you as I remember it. My New Year's eve tradition as of late has been to cozy up in a recliner at my home in Texas and watch Kathy Griffin harass Anderson Cooper about being a Vanderbilt until the ball drops. So there I was half listening to Kathy sass Anderson about his shirtless Instagram photos from his recent trip to Myanmar when I hear the voice of an angel coming from behind them in Times Square. I first recognize that it was the classic New Year's song 'Auld Lang Syne' and then I quickly realize that Queen Mimi A.K.A Mariah Carey was the one singing. 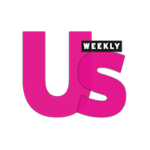 I press the "prev" button on the remote as fast as I can (any good New Year's Eve show watcher knows to have New Year's Rocking Eve preset on the remote so you can seamlessly switch between Anderson and Kathy and Jenny McCarthy rattling off Top 5 lists and reminiscing on how the show brought her Donnie Wahlberg) and there was Mariah. I missed her sing 'Auld Lang Syne' and had tuned into the part where the instrumentals of her hit 'Emotions' was playing and she was just standing there while her backup dancers flailed around. Mariah then precedes to say "We didn't have a check for this song. So we'll just say, 'It went to number one,' and that's what it is." When I finally realized what was going on I was confused, concerned and SHOOK! I had to do the only I could bring myself to do... Get on Twitter and live tweet about this!!! Now at first I thought that Mariah was just having a TRL moment circa 2001 when she popped in on Carson Daily unexpectedly with that Ice Cream cart wearing just an over sized shirt and heels but then, after further review, (and by that I mean watching it on repeat like a million times) it became clear that she seemed to have had some sound issues. She was walking around pleading for the production team to turn the monitors on and just could not seem to catch a break. I have seen what people are saying about how she was unprofessional and how her career is over but honestly that whole entire performance gave me enough life to get through all of 2017. When 'Emotions' starts she seems to crack and then tells her dancers, "Just walk me down." Later in the song she says "I want a holiday too. Can I not have one?" Clearly she had HAD IT! Listen, if it had been anyone else I probably would be shading her for it all but this is MARIAH EFFING CAREY! I usually miss this kind of stuff when it happens live and I thank the pop culture gods that I was lucky enough to witness this. From her episode of Cribs to her "Moments" on HSN, Mariah always delivers diva gold!! People can say whatever they want but this will not phase Mariah. She is my spirit animal because anyone who can walk around on stage in front of thousands of people on live T.V. while her pre-recorded whistle tones go off like bombs in the night and still give 0 fucks is my QUEEN!! 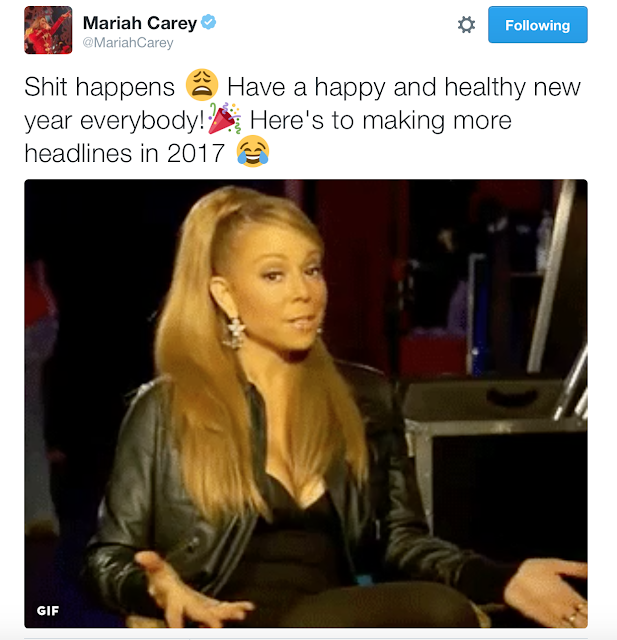 No matter what you do for work or in life we have all had a Mariah moment. Sometime the instrumental of your hit song is just playing, people are doing their choreo around you and you are just standing there waiting for the feathers to cover you up so you can get off stage. At the end of the day people need to get off Mariah and stop coming or her wig. Where was this type of outrage, attention and criticism when Trump was giving similar performances all election season long? !